"Great Projects" videos and companion book at ShopPBS. 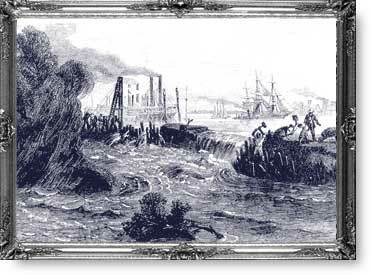 Question 1: A common disaster of the early 1800s was described like this: "A sudden wrench, the rush of sucking water, a clanging of bells, terrified screams, and the current would sweep over another tragedy." What disaster was it? © 2002 Great Projects Film Company, Inc. All Rights Reserved.